This year, profits generated from our farm’s CSA business is going into building a fruit orchard, raising animals like pigs (for meat) and sheep and goats (for milk and maybe wool). All plants and animals are going to be grown with the highest organic and humane standards. We are really excited for what the next few years will hold for the farm. We also have ordered a lot of blackberry and raspberry plants! We started it on a very small scale a few months ago, but we are going to have plenty for the CSA in the future. This week we are putting Hachiya persimmons into everyone’s share with an extra thanks to Whitney Ranch out in Carpinteria. We usually purchase blueberries from them during the season, but they had some ripening persimmons that needed to be used this week. If you’ve never had one, you are in for a real treat. WAIT until the persimmon is soft like an avocado. It’s the closest thing to a gummy bear I have ever had and is amazing in oatmeal in the morning. Cut off the top and put in the freezer in the morning, and at night, take it out for a PERFECT sorbet. You can even peel them, chop them up and add coconut milk in a blender or food processor. Need I go on :)?! Cindy Dollar is cooking up some Raisin Pecan Granola for us this week. Check it out in our CSA store and support a local business while enjoying some insanely delicious granola. This entry was posted in Uncategorized on January 26, 2015 by Carolyn. The chickens are enjoying this warm weather. We spent the weekend combining some of the newest chickens into the flock. We section them off in the big coop so they can get used to being around the rest of the birds. After a few more weeks, when they are big enough, they will join the group. We also got a shipment of new chickies on Friday. 25 new chickletts joined the farm, although only 20 made it through the flight. I look forward to making our own chickens in the future. I don’t like the idea of the little chickens not having a mom. We are starting to get more eggs now and I will notify people on the waiting list as they become available. If you are interested in having fresh, organic eggs in the near future make sure you add yourself to our waiting list. Cindy’s healthy creations is cooking up some delicious Pumpkin Pecan granola for us this week. Its made fresh to order so make sure to grab yours here in our CSA store and support a local Goleta business. I love sprinkling it over Greek yogurt!! Bring the quinoa and water to a boil in a small sauce pan. Cover and reduce to low. Let simmer for 10 minutes, or until all the water has been absorbed and the quinoa is fluffy. Keep covered for another 3 minutes, then fluff with a fork and transfer to a mixing bowl. 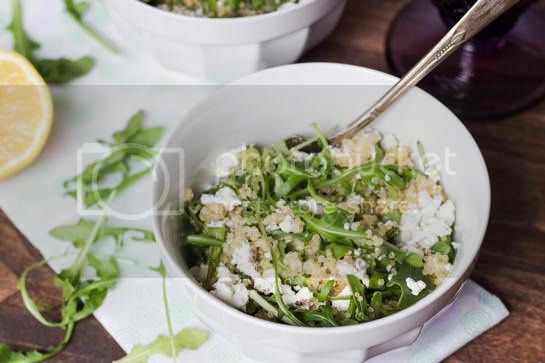 Add the arugula to the bowl with the hot quinoa and stir until the greens have wilted a bit. Squeeze the lemon juice over the salad and mix together. Season with salt and pepper to taste. Transfer the salads to two bowls and top with crumbled goat cheese bits. Serve immediately. 1.Heat the oil in a large frying pan or wok, and add the leek and garlic. Cook over a medium heat for about 3 minutes, until fragrant. 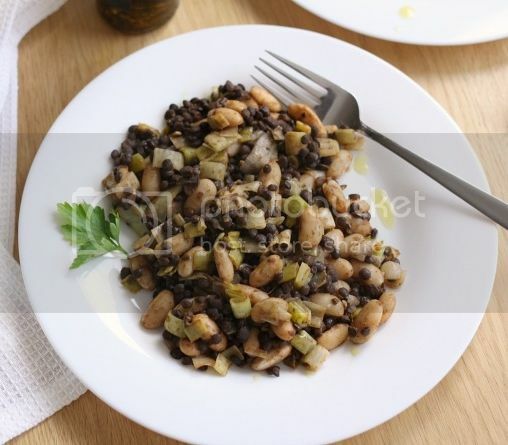 2.Add the cannellini beans, cooked puy lentils, and smoked paprika, and continue to cook for a further 5 minutes, stirring regularly. If the mixture seems to be drying out too much, just add a dash of water. 3.When everything is hot, season to taste, and serve drizzled with extra virgin olive oil, and with fresh parsley if desired. Try out these Cinnamon Sugar Radish Chips mixed in with greek yogurt and a spoonful of honey! Crazy, maybe. But even the kids will dig this one! To cook the lentils: Pick over the lentils to remove any bits of debris. Rinse the lentils under running water in a mesh colander. In a medium pot, combine the lentils, halved garlic cloves, olive oil and 4 cups water. Bring the water to a boil, then reduce heat to a gentle simmer and cook until the lentils are cooked through and tender, which will take somewhere between 20 to 35 minutes. Drain the lentils and discard the garlic cloves. To make the dressing: Whisk together the ingredients in a small bowl. If you’re using pre-steamed lentils instead of cooking your own, add an extra clove of minced garlic and an extra tablespoon of olive oil. 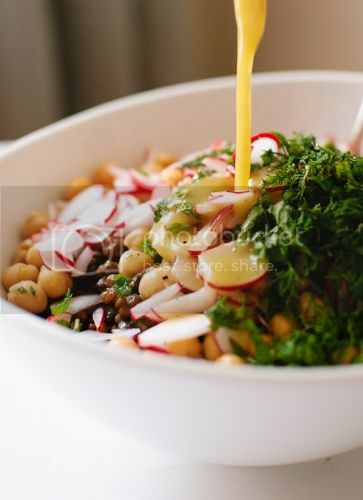 In a large serving bowl, combine the lentils, chickpeas, chopped radishes and herbs. Drizzle in the dressing and toss to combine. Serve with avocado, crumbled cheese or fresh greens if you’d like. 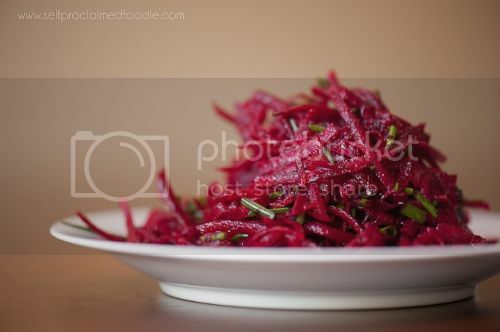 Shred beets and add to bowl. Add zest and juice from entire orange. Add zest and juice from lime to taste (this amount is subjective). Add olive oil and toss to combine. Add salt to taste and toss to combine. Add chives just before serving. This entry was posted in Uncategorized on January 19, 2015 by Carolyn. We enjoyed a rainy weekend here on the farm. All the water is great for the crops and helps reduce the bad bug populations here. We are all in our mud boots and happy about it. Spring crops are being planted with a few new varieties. We are looking forward to green cabbage and strawberries within weeks. We are still seeing the after effects of the bagrada bug which has diminished our winter variety. Hopefully you enjoy the Brussels from Willey’s farm. They are a really cool, old school, organic farm based in Northern California. Cindy’s healthy creations is cooking up some delicious Coconut Seed granola for us this week. Its made fresh to order so make sure to grab yours here in our CSA store and support a local Goleta business. This entry was posted in Uncategorized on January 12, 2015 by Carolyn. The farm has been dipping down into the freezing temperatures over the past week. It’s amazing to see how everything that’s growing sort of comes to a standstill. We are starting to see the repercussions of some earlier damage by a new bug that killed off most of our broccoli, cauliflower, cabbage a few months ago. A lot of those yummy veggies will be coming later in the winter season, even at the start of spring. We were forced to wait until it got cold enough to kill the bugs until we could plant those items. Strawberries are also on their way back. If the weather continues on like it has today, we could have them in as early as 3-4 weeks. We are also planning on so many new crops to grow next year including, scallions, red onions, artichokes, fruit trees of all sorts and many more. We also are back up to about 150 chickens and counting. By summer time we will be able to offer a lot of egg subscriptions. By supporting our CSA during these winter months you have committed to eating local in a big way. You are planning your meals around the seasons availability instead of whatever is shipped into the grocery store. You aren’t supporting plastic wrapped vegetables with stickers on it. Instead your produce has been minimally packaged (or none at all) which is the most sustainable way to go, unless you are growing it yourself. Even though we don’t have a huge availability during the winter time, we still have a lot of great things to cook with. Feel free to send recipes my way. We will post them on our website to inspire others. Our granola of the week is Cashew Cranberry. It’s one my favorites and is made locally here in Goleta by Cindy Dollar. It’s made fresh to order so make sure to include a bag with your share this week. Check it out here in our CSA store. This entry was posted in Uncategorized on January 6, 2015 by Carolyn.